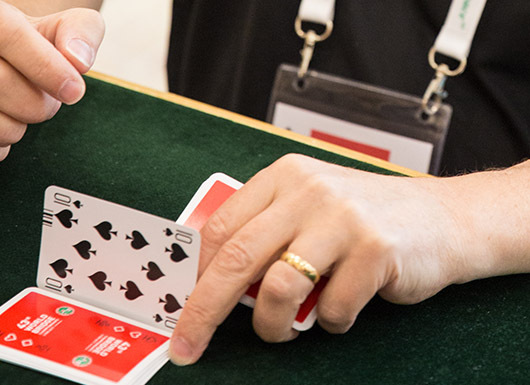 There is no doubt that the aspiring player can learn a great deal by watching top-class bridge. Of course, even the very best will make mistakes – that is in the nature of the game – but one can acquire a great deal of knowledge. West was happy to overcall, despite the lack of a sixth diamond. At the vulnerability he gave no though to showing his two-suiter. He led the Q and declarer won with the ace,played the J to dummy’s ace followed by a heart to the nine. When West discarded he drew the outstanding trump and played a low diamond. West won and returned the J for the queen, king and a ruff. At this point, declarer claimed. Playing a diamond establishes a trick in the suit and declarer will be able to pitch one of dummy’s spades and eventually ruff a spade in dummy. West’s overcall was enough to persuade declarer to take the heart finesse. West led the K and declarer won, played the J to the ace and a heart back to the king. There was no way to recover when West discarded, so Zimmermann collected 10 vital IMPs. 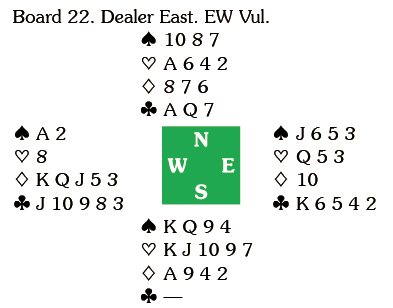 West, who had not overcalled, led the K. Ignoring East’s ten, declarer ducked and West continued with the Q. 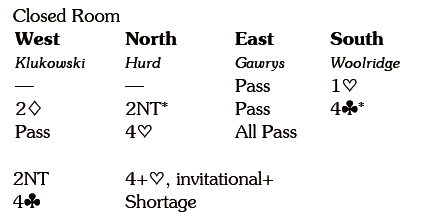 If East ruffs this and returns a spade the contract is dead in the water, but towards the end of a long event fatigue plays a part. When East pitched the 4 declarer drew trumps via a finesse against East and played a diamond to establish the nine, +420. As an aside the operator reported some heated discussion in Italian at the conclusion of the deal. Declarer won the diamond lead and followed Helgemo’s line of play to flatten the board. You must decide for yourselves if it is right to overcall 2 . Like any action of this type it has pro’s and con’s. By showing length in the suit you give information away, but if partner is on lead a diamond may well be the best start for your side. Here, the appearance of partners 10 at trick one gives declarer a clue, even if you don’t overcall. I suspect by now you have decided that taking the heart finesse is the indicated play.